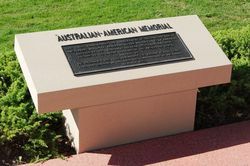 The Australian-American Memorial is an important symbol of Australian gratitude to United States of America service personnel for their contribution to the defence of Australia during World War Two. 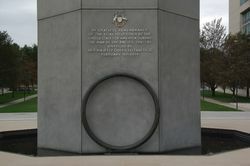 It is also a symbol of the close ties which were established during the War. 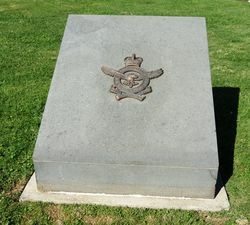 Work commenced in December 1952 and took just over a year. 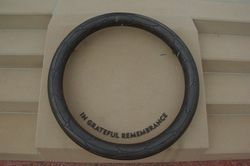 Then Vice President of the United States of America, Richard Nixon, visited the site in the early stages of construction. 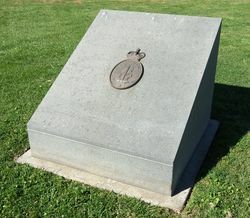 The memorial is a hollow, octagonal, tapered column with a steel framework sheeted with aluminium panels that were sandblasted to give the appearance of stone. 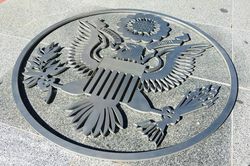 Two murals feature at the base, one relating the story of American combat in the Pacific and the other a profile map of the United States in copper. 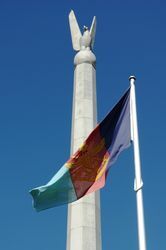 The column is surrounded by a water-filled moat about 3m wide. 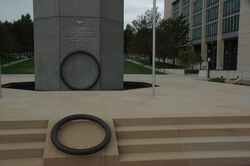 Under the dedication is a bronze wreath where floral wreaths are often laid on official commemorations. 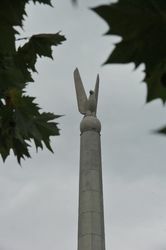 The column is topped with a bronze sphere surmounted by a stylised figure of the American Eagle. 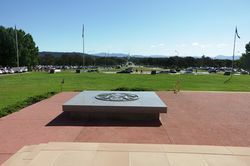 The Queen, today unveiled the Australian National Memorial to the United States of America. 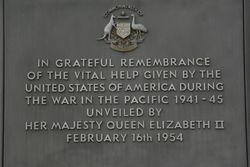 She said the memorial would stand as a permanent testimony to the thankfulness of the Australian people for America's friendship and support in the war. 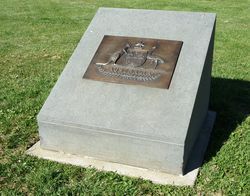 The Queen also visited the nearby Australian War Memorial. 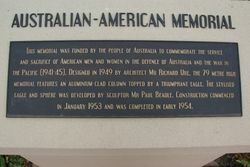 About 500 members of the Australian American Association were flown into Canberra from all over the Commonwealth for the unveiling. 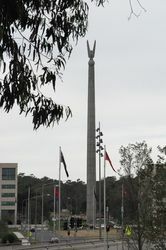 The octagonal tapering column topped by an Aluminium American eagle with it swings outstretched was built by the Australian American Association through contributions by the public and the Commonwealth Government as a tribute of thanks for American help during World War II. The Dubbo Liberal and Macquarie Advocate (NSW), 16th February 1954. 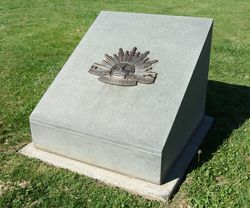 THIS MEMORIAL WAS FUNDED BY THE PEOPLE OF AUSTRALIA TO COMMEMORATE THE SERVICE AND SACRIFICE OF AMERICAN MEN AND WOMEN IN THE DEFENCE OF AUSTRALIA AND THE WAR IN THE PACIFIC (1941-45). 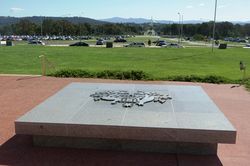 DESIGNED IN 1949 BY ARCHITECT MR RICHARD URE, THE 79 METRE HIGH MEMORIAL FEATURES AN ALUMINIUM -CLAD COLUMN TOPPED BY A TRIUMPHANT EAGLE. 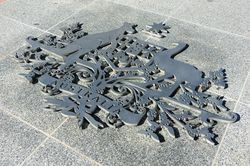 THE STYLISED EAGLE AND SPHERE WAS DEVELOPED BY SCULPTOR MR PAUL BEADLE. 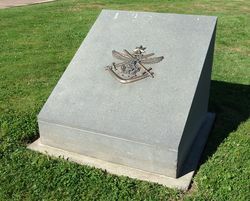 CONSTRUCTION COMMENCED IN JANUARY 1953 AND WAS COMPLETED IN EARLY 1954.